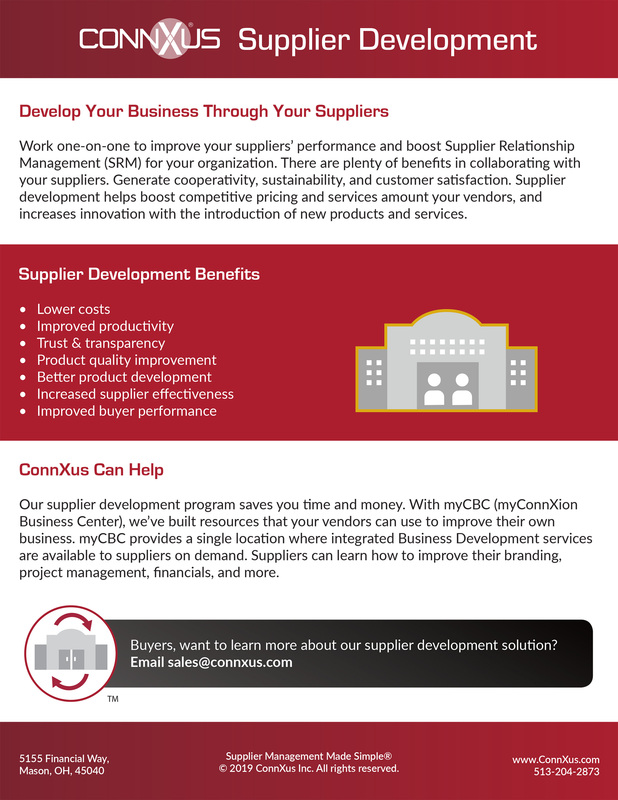 MASON, Ohio, April 10, 2019 /PRNewswire/ -- "As an innovator in the Supplier Relationship Management (SRM) space, we're thrilled to announce the launch of our new supplier development program myConnXion Business Center (myCBC) and the new ConnXus Verified & ConnXus Certified programs," says Daryl Hammett, COO/GM. Along with two new partnerships, we continue our commitment to excellence, delivering resources to help you grow your business. myCBC helps businesses of all sizes and diversity status prepare for the right buyer opportunity. With our network of affiliates and a robust knowledge base, we can help you improve your branding, project management capabilities, financial know-how, and more. Our in-person events & upcoming online webinars provide great opportunities for networking and development. Registration in myCBC is free. With a tiered membership option, we have flexibility. Just sign up with your company profile at mycbc.myconnxion.com. Certified diverse suppliers can become ConnXus Verified, an in-house credentialing program that "verifies" your current diversity certification so buyers do not have to. Simply upload your existing diversity certification and follow the simple steps in our application, myConnXion, and gain access to procurement professionals within our community. Coming soon in the summer, we'll offer our own diversity certification process (ConnXus Certified) so you can rest easy knowing buyers have access to your most up-to-date supplier profile. Our new partnership with SecurityStudio brings the power of FISASCORE to your fingerstips. FISASCORE is a self-assessment tool that analyzes your company's security standards and provides an estimate of your security risk. Trusted by companies large and small, FISASCORE uses industry standards to identify vulnerabilities, control gaps, and threats to your organization's administrative, physical and technical controls. The end result is a score from 300 to 850 that can be used as a standard way to easily communicate your organization's security to potential buyers. With the integration of SecurityStudio solutions, we enable you to get your score, find your company's pain points, and get a security action plan all within myConnXion. "We are very excited about our relationship with ConnXus. They have an outstanding reputation in the supplier management space, and our integration will provide real value to our mutual clients. Integrating FISASCORE™ with the myConnXion platform provides clients with the most complete supplier management solution in the market." We've partnered with Sourcing Industry Group (SIG) and SIG University, a comprehensive certification program for sourcing professionals. Through our partnership, we'll offer suppliers access to SIG University's Certified Sourcing Professional courses in the following topics: Statement of Work, Intro to RFX, Implementation Planning, Project Management, and Negation Preparations. "We believe this partnership is a great opportunity to develop and educate suppliers all over the world to become more competitive and beneficial to buyers," said Dawn Tiura, CEO and President of SIG University. "SIG University is committed to offering a premier learning environment that focuses on enhancing the skills, competencies and performance of professionals in sourcing and procurement."